The P-107 is a VHF Manpack FM transceiver designed for communications up to company level. Frequency range 20-52 Mhz, channel spacing 25kHz. 1231 Channels in two bands, Band One 20-36 MHz and Band Two 36-52 Mhz. It has both continuous tune and pre-set capability with up to four pre-set frequencies. The set has a power output of 1 Watt and a range of 6 kilometres ( 3.75 miles ) with a whip antenna 6-8 Km ( 3.75 - 5 miles ) with a combined rod antenna and 12 - 25 Km ( 9.4 to 15.6 miles ) with a travelling wave antenna. The set can be used as a radio relay station and can be remotely operated by using standard field telephones. Power for the set is supplied by two rechargeable KNP-20 2.4V batteries. Frequency range 20-51.5 Mhz, 25 Khz channel spacing, 25 Watts output. Can be continually tuned over the entire frequency range, or one of four pre-set frequencies. The set is capable of transmitting over a range of 16 to 55 Km (10 to 35 miles) depending on the type of antenna. Requires 26VDC to operate. The Russian P-126 is a small short range VHF FM transceiver. Manufactured in 1962 it is a ruggedly constructed light weight battery operated radio. It was used by Russian and East German Army's as a manpack set for short range Platoon to Company communications. The Russian P-147N is a very small 4 channel Crystal Controlled short range VHF FM receiver. It was used as a manpack set for Platoon communications. Frequency range 44.0-51.8MHz in 100kHz. 100kHz channel spacing. Fully transistorised with thick film technology. Powered by 6-7.5V rechargeable battery or external 9V dry batteries. Sizes 58 * 45 * 126mm. The Russian P-158 is a fully transistorised short range VHF FM transceiver. It was used as a manpack set for Platoon to Company communications. Frequency range 30.000-79.975MHz, channel spacing 25kHz. Modulation FM R/T. Output power is approximately 2 Watts. Powered by a rechargeable battery. Russian P-323 is a self-contained triple conversion VHF communications receiver using miniature tubes. Manufactured in the late 50's, it was used either as a manpack or fitted in to vehicles for intercept and monitoring purposes. AM, CW and FM. Frequency range 20-100 MHz in four bands. Continuously tuneable within the band it has a unique mechanical projection tuning scale were the frequency read-out is projected optically on to a glass screen. The receiver is powered by two 1.2V rechargeable batteries fitted in a compartment at the back or by external AC Power Supply for 110-220 VAC operation. Russian P-326 is a self-contained HF communications receiver using miniature tubes. Manufactured in the late 50's, it was used either as a manpack or fitted in to vehicles for intercept and monitoring purposes. AM and CW. Frequency range 1-20 MHz in six bands. Continuously tuneable within the band it has a unique mechanical projection tuning scale were the frequency read-out is projected optically on to a glass screen. The receiver is powered by two 1.2V rechargeable batteries fitted in a compartment at the back or by external AC Power Supply for 110-220 VAC operation. The Russian P-407M is a single channel full duplex 2 or 4 wire radio-relay station using tubes. Frequency range 52-60MHz, channel spacing 50kHz. Modulation FM R/T. Output Power 1 Watt. AF bandwidth 0.3-3.4 kHz. Ringing tone 30-50Hz. Powered by two 2.4V rechargeable batteries. The Russian P-809M2 is a fully transistorised portable Ground to Air VHF AM transceiver. Frequency range 100-149.975 MHz in 25kHz steps, channel spacing 25kHz. Modulation AM. Output power is approximately 0.5 Watt. Powered by 12V rechargeable battery or AC power supply. The Oscilloscope Probe Type M-12X1 is a miniature X1 passive probe intended for use with a wide range of oscilloscopes. These probes were manufactured to the highest specification in England for use in the military workshops and have a NATO Stock Number Z4-6625-99-726-2877. The probes modular construction facilitates simple field replacement of the major parts (see dismantling section below). The probe is supplied Brand New with a complete range of accessories. The RT-3600 is a Dutch Army wide band VHF transceiver operating in the 25-70 MHz band. The RT-3600 was made by Phillips Telecommunications Industry in Netherlands. Channel spacing is 50 kHz. Operating distance in open field is between 8 and 30 km. When used with the RF Amplifier ôAM-3600ö output power of up to 45 Watts can be achieved. The Phillips PRC/VRC-4600 family of modular radio equipment is designed to be very configurable and can easily be adapted to different roles by adding or removing units. The RT-4600 is the successor to the successful RT-3600 family of radio equipment and was in service with the Dutch army during 1980-1990?s. The equipment consists of a number of basic units which can be combined into various configurations, ranging from a simple low powered man-pack to a complex 30 Watt vehicle or Tank configuration as well as radio repeater roles. Various configurations make for greater tactical flexibility.Duplex working, retransmission, intercom, telegraph facsimile, medium speed data transmission, are all possible with this radio station depending to the units used. Advanced circuitry, rugged and 100% solid state construction assures easy, reliable and trouble-free operation under severe combat operations. The PTR1751 is lightweight UHF military airborne transceiver designed to provide air-to-air and air-to-ground communications under severe electrical and environmental conditions. Used by RAF, British Army and Royal Navy, it is suitable for use in all types of helicopter and fixed-wind aircraft, and is intended primarily for air traffic control, but this role can be extended with optional extras to include homing and continuous AM reception on the international distress frequency of 243 MHz. The PTR1751 operates over the 225 to 399.975 MHz frequency range and provides 7000 channels at 25 kHz intervals throughout the range. The channel spacing is 50 kHz with 25 kHz spacing available as an option. The power output is 10 or 20 W minimum, under all conditions of operation. Part Number: 630/1/37851/119, Nato Number: 5821-99-778-7570. Weight 8Kg. Self contained portable field instrument for calibration of British W.W.II. radio receivers and transmitters such as Wireless Set No. 18,19, etc. to a given frequency. Manufactured in 1943. Frequency range 1.9-8 Mhz in two ranges. Powered by external 6V battery. Accuracy +/- 2kHz. Supplied in good condition and includes Transit Case No. 7 and accessories. For RT-66, RT-67, RT-68 transceivers provide all the voltages from 24 VDC @6.5 Amp input. Radio set AN/PRC-10, frequency range 38.0 to 54.9 MHz, Super-Heterodyne FM Receiver / Transmitter. Man-Pack or Vehicular fixed station operation.1 Watt transmitter Output. Uses 16 miniature wire ended tubes. Power requirements 1.5V, 6V, 67.5V, 135V powered by BA-279 battery. The AN/PRC-10 is part of a family of radios AN/PRC-8, AN/PRC-9, and AN/PRC-10 which were used as a squad radio by US Army in Korea and Vietnam Wars and by many NATO countries. Made in USA in 1950's and 60's, each radio had a different frequency range. The PRC-10 is supplied in good working condition Grade 2 with the Battery Box, but no other accessories. H-33/PT Handset is available separately. The Power supply connector / adaptor for the PRC-349. Fits as a normal battery pack and allows the radio to be connected to an external 12 VDC PSU or battery. NATO Part Number 6625-99-649-5584. Supplied in New condition. PRC-349 brand new spare Discriminator Module number 5. NATO Part Number 5820-99-643-8404. Crystals for the American PRC-6 sold as matched pairs. (No choice on Frequency). Empty crystal storage box for the German PRC-6/6. Spare Tubes for the German PRC-6/6 radio. This set include the following miniature tubes in new condition.4* DF61, 2* 1AD4, 1* 5672, 1* 5678, 1* 6397. Total 9 tubes. Similar to a PRC-2000 Made by M.B.L.E. HF Transmitter / Receiver, USB, NBCW, CW, AM, Fully synthesised, Mobile back-pack radio, has rechargeable batteries 14.4 Volts, or external power. Supplied with back pack harness, remote control with cable, batteries, hand set and antenna. The AN/PRC-68 was first introduced in the 1970's and was used by the U.S. Marine Corps. The radio is a small lightweight hand held device working in the VHF frequency band of 30-79.95 Mhz. Frequency Synthesizer operation with ten preset channels that can be programmed using internal selector switches. The design was so successful that it lead to the development of other radios in the series such as PRC-PRC-126, PRC-128 and PRC-136. The PRC-68 is probably the first military radio to use a Synthesizer Chip and is completely solid state and has built in battery saving features. Using discrete components and a modular construction the radio is easy to serviced. The radio has a built in speaker / Microphone, Volume control and Squelch facility. External audio connector is also provided to allow operation with a H-138, H-139 and H-250 Handsets. The radio can be used with a short or long antenna and operates from a 15 Volt battery not available. The PRC-68 radio is supplied in good working condition Grade 2 and includes the carry pouch and short antenna. Here we have a bunch of PRC-77 Modules and spare parts. These are all in NOS New Old Stock condition and are original American made parts made by Napco and Associated Industries & Equipment in USA. Once these parts are gone, that's it, there would be no more available. Below is a list of the PRC-77 modules and the quantities available. These modules are for bulk purchase only, they are not available in single units. Please email for prices and details. These were removed from British Military aircraft's. 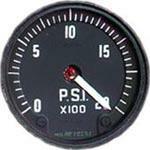 They indicate pressure in PSI (Pounds per Square Inch) and the scale is market from 20 to 0 X100, with the indicator needle starting at 20.